You Are Here: Home » Blog » history » When did compact spare tires start being used? When did compact spare tires start being used? So when did compact spare tires start being used? If you guessed early 20th century then you are way off. Although spare tires are common in modern vehicles, the first automobiles didn’t actually have spare tires at all, let alone compact spare tires. One of the leading car manufacturers in the early 1900’s — the Thomas B. Jeffery Company — was the first automaker to began outfitting their passenger automobile with a spare tires. In 1909 Rambler introduced their latest vehicle, the Ramble 44, a modest touring car that could seat up to five passengers for only $2,250, but for only $74 more customers could purchase an extra wheel and inflated tire that could be easily swapped out with a flat or damaged tire while on the road– it was the first spare tire. The Rambler’s spare tires were a huge success and from that point on it became standard practice for automakers to include a spare tire on every new vehicle. 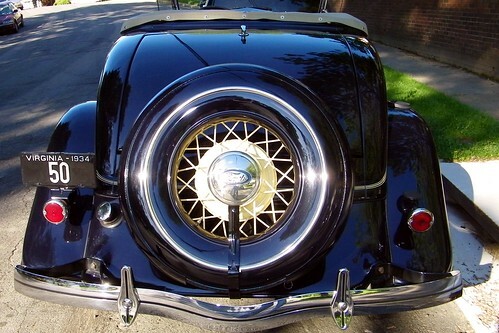 The first spare tires that were included with early 1900’s automobiles were mounted on the passenger side of the vehicle frame, though years later automakers began to mount spare tires on the vehicle’s trunk; however, other early automobiles like the 1931 Nash Ambassador featured two dual side-mounted spare tires. These early spare tires were actually full size tires, no different from any other tire on the vehicle unlike many of the Temporary Use Spare Tries (TUSTs),or compact spare tires, that are used today. So when did compact spare tires start being used? Although the first spare tires were introduced by Rambler, the compact spare tire was not used in cars until the late 80’s. The compact spare tire was designed by P. Fletcher for Volkswagen Automobile Company in the 1980’s as a way to reduce costs for the German automaker — the compact spare tire was much cheaper to include in new Volkswagens compared to full-sized tire; the compact spare tires were smaller and not nearly as durable as a regular full-sized tire. As such, the compact spare tires used nowadays are intended for limited use and do not work with many of the standard safety, control, and monitoring features that are included with most modern vehicles. The compact spare tire has been used in countless cars since the 1980’s and anyone that has had put a spare tire on their can has no doubt used one. One could even say that compact spare tires have helped save the environment since they require less material than full size tires and their lightweight construction has worked to improve vehicle fuel economy, every pound counts after all. However, today people often choose to get full sized tires installed in their car so that they can continue driving without incident, especially if their car is equipped with high performance tires.